The event is hosted by the Budweiser Clydesdales at their stable on the parking lot of Grant’s Farm. All collected toys will be loaded up in a Marine truck and delivered to the less fortunate in the St. Louis community this holiday season. You’ll need to donate a new, unwrapped toy (or bring $10) to get in. 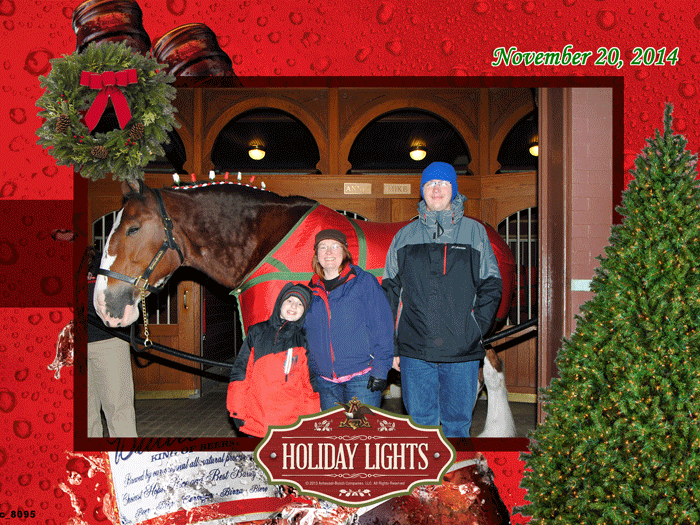 In return, you’ll get a little gift in return: a photo with a Clydesdale AND a Marine and a free raffle ticket. The gift shop will also be open for a little holiday shopping–and you’ll get 10% off with your donation! Don’t miss special appearances from St. Louis Cardinals Alumni, Fredbird, a live band, The Affton Fire Department and EMS, The St. Louis County Police Department and the Animal R Us petting zoo! Clydesdales and Marines in full dress will be happy to take photos with you and the kids–maybe for your Christmas card? Hmmmmmm? They will print a photo for you for free, as a thank you for your donation. My photo here is from the Holiday Lights over at the Brewery last year. You can also bring your own camera and get a good snap for your Christmas card! There will be a raffle for fun prizes, like ginormous horse shoes and VIP tours for next season. Every toy or $10 donation earns a ticket! And don’t forget, there’s always free samples of Budweiser.